This project is a great accompaniment for autumn place settings, and can be placed on the dinner or picnic table with the place settings. They are affordable to make, as you can often find bags of tea light candles for a couple of dollars, and the apples can usually be purchased fairly cheap. Using the knife and the spoon, scoop out the center of the apple from the top. Discard the seeds. Cut down only far and wide enough for a candle to fit in snugly. Wipe the apple with a cloth. Use apples from your own orchard to save money. Look for candles at the dollar store for extra money savings. Place these candle holders on the holiday table, or on stands as part of the overall decor. These can be used for any autumn day, but are especially wonderful additions to Halloween and Thanksgiving settings. These are also great for Samhain. Create a centerpiece with these by placing them on a plate or in a baking dish. Strew autumn leaves, pine cones and acorns in the bottom of the dish, add the apple candle holders, and then place the arrangement on the table. Enjoy the autumn holidays! Do you have any apple craft ideas? Please post them to the comments. Apple place markers are adorable and easy to make. A place marker is used to help you to put each person at a specific place at the autumn-themed or Thanksgiving table. Place an adhesive square to the back of an apple embellishment, and place it to the left or right side of the place marker – leaving enough space on the smaller piece of paper to write the person’s name. Place a sticker to the top center to the inside of the place marker. Using the pen, write a guests name on each and then open the card and turn it to the inside. Write ‘I am thankful for:’ at the top just under the sticker, and the year at the bottom center. This project is a great accompaniment for autumn holiday meals, and can be placed on the dinner or picnic table with the place settings. They are affordable to make, as you can often find bags of tea light candles for a couple of dollars, and the pumpkins can usually be purchased fairly cheap. Using the knife and the spoon, scoop out the center of the pumpkin from the top. Set the seeds aside for roasting. Cut down only far and wide enough for a candle to fit in snugly. Wipe the pumpkin with a cloth. Use pumpkins from your own pumpkin patch to save money. These are also great for Samhain, and can be placed on the porch railing to light the way up to your door. Create a centerpiece with these by placing them on a plate or in a baking dish. Strew autumn leaves, pine cones and acorns in the bottom of the dish, add the mini pumpkin candle holders, and then place the arrangement on the table. Enjoy the autumn holidays! Do you have any pumpkin craft ideas? Please post them to the comments. My parents had a successful harvest this year, and they always seem to plant enough to share with my siblings and me. 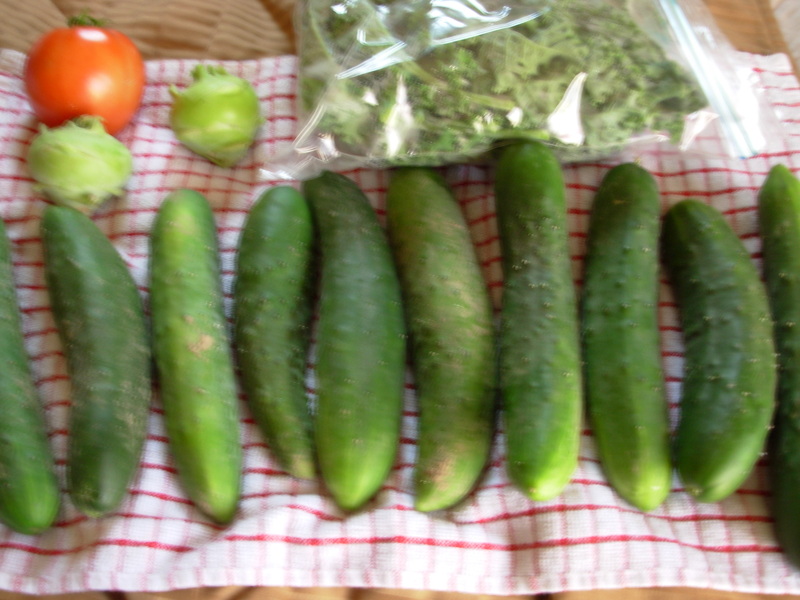 It started with the cucumbers that mom brought over, a couple of times. Once, because she knew I was visiting with my daughter, she sent some for me to take to her. There was zucchini and kohlrabi as well. Then tomatoes. Huge beefsteak tomatoes. And kale. All this food, tasting so much better than what I would have bought in the store. Delicious! I gave a few cucumbers, zucchini, and a squash to friends as well. Everyone loves the fresh produce! I went to help my mother with the harvest one day. We got all the squash in, and the tomatoes (sadly, most were lost to blight! 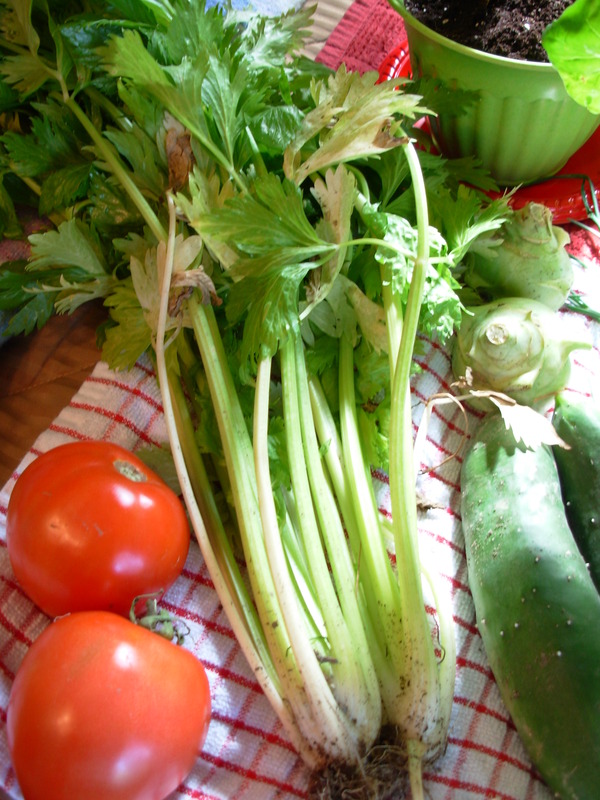 ), the last of the kohlrabi, and a few plants for me to bring home. And chives. When the girls and I lived in the apartments, back when they were still my precious little girls <3, there were chives growing in our little garden from the previous tenant. When I moved us to the trailer park, I brought them with me and replanted near the Day Lilies. They thrived. I gave some to my mother, and missed them when I moved again – for I can’t have a garden where I am. I harvested a bunch when I was visiting with my mother that day, brought them home, and froze them in water making ice cubes for soups and other recipes I’ll make this fall. After this all-important harvest, for we did not want the frost to harm the produce, mom sent me home with quite a bit of stuff. Two beefsteak tomatoes, a couple of bunches of celery, two kohlrabi, two more zucchini, chives, and two of each type of squash. In the front, notice the mini squashes. They aren’t good to eat, but are perfect for autumn decorating. And notice the four potted plants. Two chard and two kale. We harvested all this, and much more, on September 23rd – the Autumn Equinox – and these four plants are still growing in my room. They are so good! The food in this picture is quite the harvest for a single lady such as myself; imagine what else my parents harvested! For themselves, and for my siblings. And we all share with others, at least somewhat. Plus what they gave me before our harvest day. And just yesterday my mother and brother stopped by, bringing me two more of each type of squash and some carrots. I do so love carrots, and I have experimented with stuffed squash recipes this year. All-in-all, I would say my parents had quite the successful harvest this year. What do you think? All I have left are the frozen chives, the four plants, six squash, and the carrots. The food was delicious, and I loved every bit of it. Harvest time is my favorite time! And it is a great money saver for me. 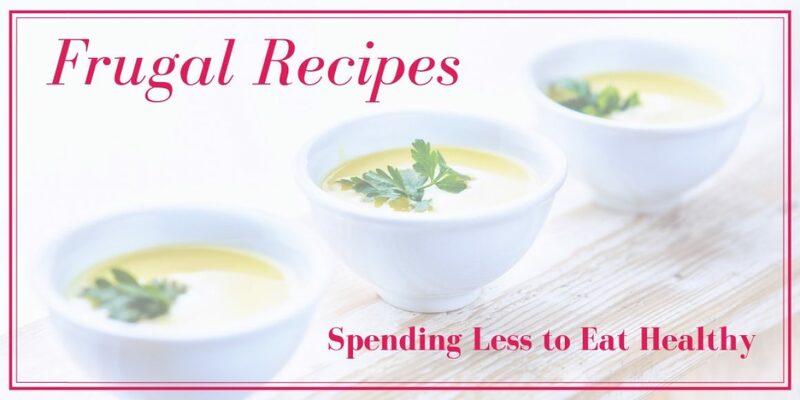 Did you grow food this year to help lower your food budget? How was your harvest? Did you enjoy the experience? Let us know in the comments, or email me privately at shannonlbuck@gmail.com. I answer all emails. Autumn is here, and I’m using the slow cooker more and more. I love this time of year! The beautiful colors. The smell smoke from a wood stove here and there while out walking. And the aromas coming from kitchens as people are baking and cooking. The squash I used in this recipe came from my parents garden, and it was delicious. I also used some of this squash when making the Butternut Squash and Carrot Mash. Cut the ends off the carrots, and peel the sweet potato and squash. Save the carrot ends and sweet potato peels in an odds and ends bag in the freezer, to be used when making homemade stocks and broths. Throw the rest out or compost it. Cut the vegetables into bite size chunks and place them into the crock. Add the sausage after cutting it into bite size pieces. Pour beef broth or water over the contents of the crock. Cover and cook. High = 3 hours/Low = 5 or 6 hours. Carrots should mash easily with a fork. 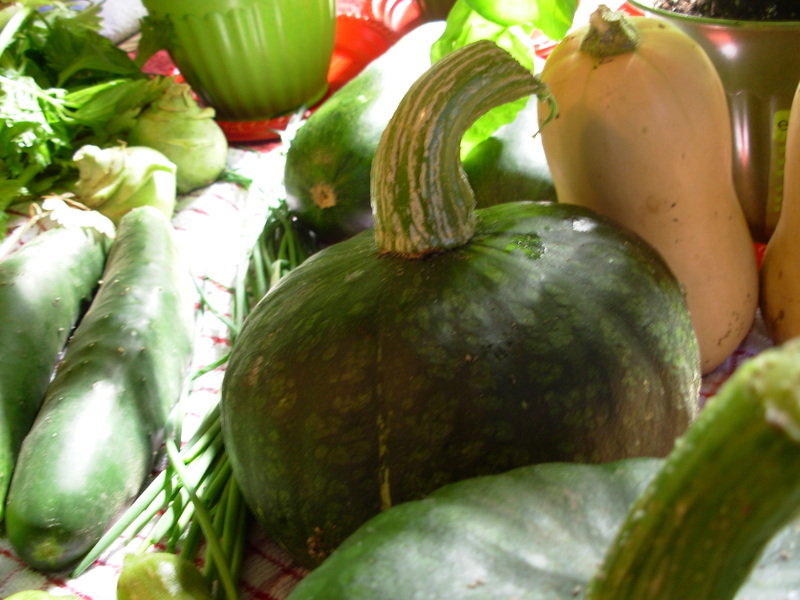 Try different types of squash. Acorn is a good one, and there are others. There are also different varieties of carrots. 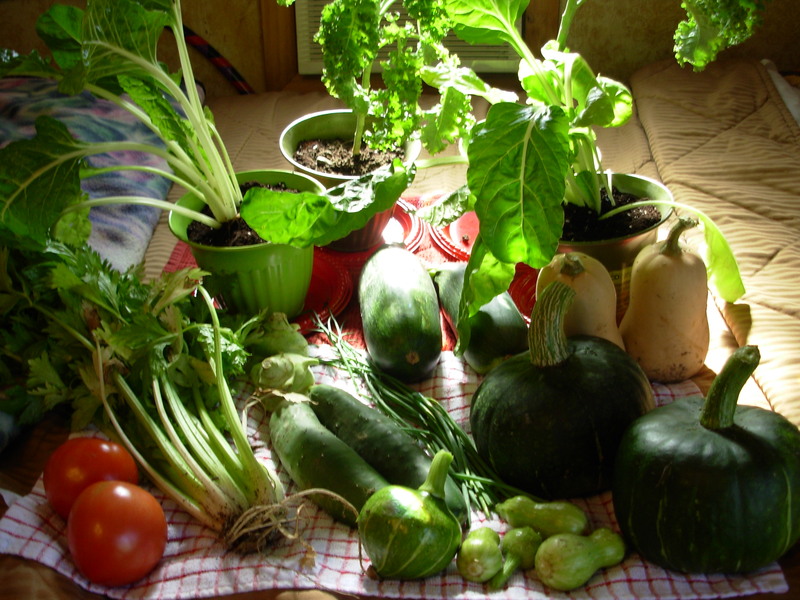 Grow your own vegetables to save money. Use coupons combined with sales when buying sausage to save even more. Serve with a side salad of greens, cucumber, and cherry tomatoes.